and exophthalmos. There are also bilateral periorbital oedema. Thyroid eye disease is one of the commonest cases in the final MRCOphth, it is important that you know it well. It can be presented as a spot diagnosis, orbital examination or ocular motility examination. The patient has bilateral (unilateral) exophthalmos with lid retractions. There are also periorbital swellings. The diagnosis is thyroid eye disease. Look at the neck for thyroid enlargement or thyroidectomy scar (this may be hidden by necklace). above). Exophthalmometer shows reading of _____mm for the right eye and ______mm for the left eye. if the problem appears to be unilateral. examine the patient's thyroid status. asymmetrical or only affect one eye). The eyes show lid lag on down-gaze. As in orbital examination, mention that you like to check the function of the optic nerve and thyroid status. 1. 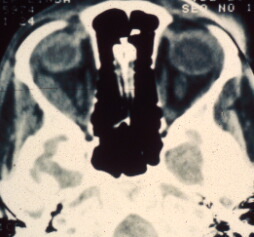 The following is the CT scan of a patient with right proptosis. What does the scan show? are characteristic of thyroid eye disease. 2. What is the thyroid status in a patient with thyroid eye disease? In the majority of cases (about 80%), hyperthyroidism is present. However, its presence is not necessary for the diagnosis of thyroid eye disease because the patient can be euthryoid and sometimes hypothyroid. 3. What are the triad of Grave's disease? The triad are eye signs, thyroid acropachy and pre-tibial myxoedema. 4. How would you manage a patient with a right upper lid retraction and an unilateral downward displacement of the globe? Before undertaking any surgery, it is important to make sure that the disease is inactive (this may take 6 months to 2 years). Regular clinical and orthoptic assessment are necessary to document the disease progress. Any diplopia is treated with prism during the active period. Once the condition is stable, surgical condition should first be given to muscle surgery as this may reduce the upper lid retraction. The cause of the downward displacement is invariably caused by a tight inferior rectus and the treatment of choice is inferior rectus recession on an adjustable suture. Any residual retraction can be treated with recession of the Muller's muscle. 5. Would you be concerned about a patient who complains of sore throat while receiving medical treatment for hyperthryoidism? Yes. This is because the use of carbimazole or propyluracil are associated with agranulocytosis which can be potential life-threatening by causing opportunistic infection and septicaemia. However, a patient who develops agranulocytosis on carbimazole may not develop the same problem with propyluracil and vice versa.